A new big thing in the works for this site are Stitching it Right Boxes! This has been taking longer to set up than I expected, but the video channel is live and the kits are in development. What Is a Stitching it Right Sewing Box? Stitching it Right Boxes are kits put together to provide you everything you need to complete one project (minus the sewing machine), and they are going to be sold through a subscription service. You can choose monthly or bi-monthly delivery, set your skill level, tell us whether you want to do a craft or a garment, and, because so many people hate cutting out the pieces, you get to choose whether you want the pieces pre-cut or you want to do the cutting yourself. 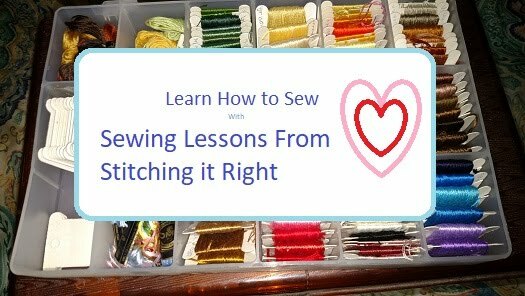 What Are the Advantages of Pre-Packed Sewing Boxes From Stitching it Right? What Is Included in These Sewing Boxes? These boxes include your pattern, in case you want to make more versions of your item after you complete the kit. Notions - thread, buttons, decals, lace, etc. In addition to everything you need to complete the project, Stitching it Right is offering extra support through this site, with a scheduled chat time once a week and other times available by appointment - and a YouTube channel is in the works, where I'll be showing how to handle the steps in each project, so you can watch the steps of each project being completed if you get stuck. If you have any questions about these fun, complete sewing boxes from Stitching it Right, be sure to ask in the comments and I'll get an answer to you right away. I just wanted to pop in and wish everyone a Happy New Year on behalf of Stitching it Right! I hope 2017 brings you peace, prosperity, and anything you want and need from your life. Please check back often, and feel free to leave a comment anytime you feel inspired to do so.